KIPP is a national network of free, open-enrollment, college-preparatory public schools with a track record of preparing students in underserved communities for success in college and in life. KIPP DC's "KIPP Through College" program supports its alumni on their journey to a college degree—helping them navigate the application process, access financial aid, connect to summer internships, and build the advocacy and decision-making skills needed to persist and graduate. The college completion crisis, particularly among students from low-income families, is unsustainable: fewer than 1 in 10 graduate from college by their mid-20s. For first-generation college students, applying to college can be daunting, and individuals may lack the resources to find an institution that fits both their academic qualifications and career goals. As a result, students from low-income families often "undermatch", choosing less challenge colleges than their academic credentials would allow them to. Research shows that students who undermatch are less likely to graduate, and today, only 8% of students from low-income families earn a college degree. Too many students invest time and money in beginning their journey to college, but drop out before earning a degree. A central focus of KIPP Through College's work is helping alumni identify and access their "best match" colleges—those that are selective, have high graduation rates, and will set them up for success. KIPP Through College maintains a comprehensive slate of data on individual colleges (including acceptance rates, graduation rates, financial aid trends, majors offered, and historical acceptance and graduation rates specifically for KIPP alumni). Alongside college information, counselors track individual student data, gleaned from student transcripts, FAFSAs, and conversations with students. College and student data feeds into KIPP's online matching tool, which uses an algorithm to create a list of potential colleges for each student, with a balance of "likely", "target", and "reach" schools. Counselors uses these lists as a starting point for meetings with each student. Each counselor is also responsible for meeting monthly targets for their caseloads, including the percentage of students who have taken the ACT or SAT, completed the FAFSA, had a college match meeting with their advisor, and submitted college applications. The team holds monthly meetings to review data and share updates for their caseloads. Last year, KIPP Through College served 1,900 District students. 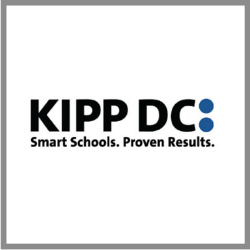 Though still in the early years of comprehensive final outcomes, 83% of KIPP DC's high school graduates have matriculated to college within 20 months of graduation. In the most recent school year, 88% of students who completed their first year of college persisted to their second year, and 96% of students who completed their second year persisted to their third. The projected college graduation rate for KIPP DC alumni is 44%, more than five times the national average for students from low-income families.